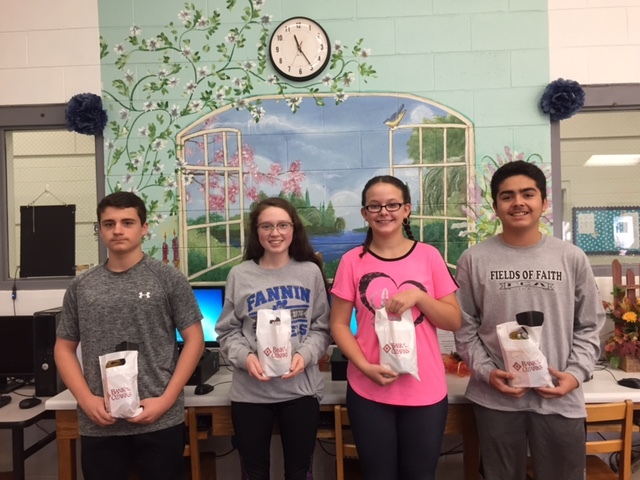 Fannin County Middle School eight-grade teams have announced Students of the Month for October. Students are chosen by their academic teachers for this distinction. Qualifications for this honor include outstanding citizenship, good attendance, respectfulness toward faculty and peers and a good academic standing. Students chosen for October are: Ashlyn Burger, daughter of James & Alice Burger, of Blue Ridge; Ricardo Arellanes, son of Camilla Patino Alvarado, of McCaysville, and Jose Patino, of Blue Ridge; Kirsten Holloway, daughter of Robert & Alice Holloway, of Blue Ridge; and Christopher Gaitanoglou, son of Pete & Molly Gaitanoglou, of Blue Ridge.